The benefits both worm castings and compost add to the vitality of our soils is well documented, as is the effectiveness of these methods in processing food waste and reducing landfill. More and more composting practices are being adopted by homeowners, businesses and even written into policy by local govern-ment, but implementing effective programs and engaging a whole community continues to be a challenge. How do you change people’s perceptions and be-haviors around waste? And how do we increase our ability to grow food in ever expanding urban environments? These are the two interconnected challenges that resulted in the “Food Know How” program, a community composting and food waste reduction initiative I helped coordinate during my two years living in Melbourne, Australia. The initiative was developed by a local non profit, Cultivating Community and the City of Yarra council, among other partners. 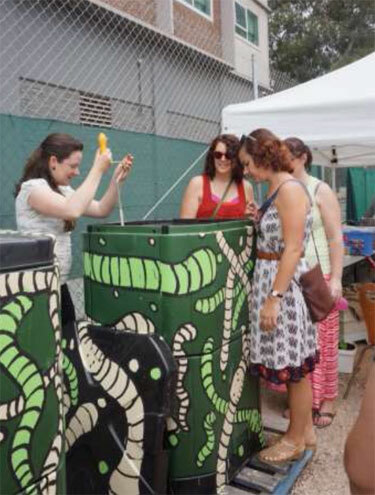 The program aspired to engage 500 residents, 32 businesses and 3 offices in various composting activities that would ultimately provide compost and worm castings to the community. The idea was to ‘close the loop’, using an extremely abundant local resource (food waste) to give fertility to the soil and increase urban res-idents’ ability to provide their own food. The program was designed to test different composting strategies including food waste collection, large scale composting, worm farming and residential com-posting at home. 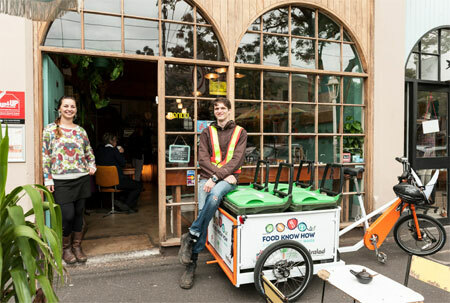 I came on board as the cafes coordinator to work with local cafes and restaurants and eventually developed a bicycle based food waste collec-tion. All the compost and worm castings produced were given away for free to local public housing community gardens, some of which housed smaller compost ‘hubs’ where the food was recycled. In many instances the cafes would be within sight of the hub where their food waste was composted or worm-composted and then used to grow vegetables by lower income gardeners. The program was funded by local and state government grants and run largely on volunteer support, with a few key part time employees. All compost systems, including our worm farms, were fed with food waste delivered from local cafes by cargo bicycle along with waste carbon sources such as non toxic sawdust, coffee chaff and autumn street leaves. The bikes were custom built to carry ‘mini’ 60 liter trash bins and volunteers committed to at least 2 hours per week to collect food scraps and cycle them to a composting site. As the program gained popularity we developed into a full service for 30 cafes with bicycle collections running 7 days per week and diverting over a ton of food waste each week from landfill. Each café that joined the program was given a bin and also training on what was appropriate to throw in the compost bin and how to get staff settled in to the program. The initial program was a free service. As with any behavior-change program some participants were eager early adopters, very engaged and responded well to feedback while others took longer to comply with the rules and fully participate. We developed a total of 6 composting ‘hubs’, including an open compost windrow, which was turned with a small bobcat, and a worm farm with an initial stock of about 400,000 worms. Forty 240 liter Council trash bins were repurposed as worm farms and retrofitted with a false floor, ventilation outlets and a drainage outlet. Trash bins were selected for building the worm ‘hub’ as a cost effective rodent-proof system that utilized local recycled materials and enabled flexibility for future relocation or reconfiguration. The bins were set in three rows in a shady corner of a large community garden. The area was surface mulched with wood chips that acted as a biofilter to absorb and process leachate from the bins. Somewhat regrettably, in hindsight, we allowed most of the liq-uid worm juice, or leachate, to drain directly into the ground. Fortunately the area was later used as garden beds and had excellent soil! The bins were a con-tinuous system, fed from the top and harvested through an outlet near the bottom. We initially stocked each bin with worms from a local supplier and used a bedding mix of coconut coir fiber and compost to get the worms settled into their new homes. The bins were initially stocked with approximately 4000 (1kg) compost worms, however this was increased to 10,000 (2.5 kg) to accelerate processing power after initially low feeding rates were observed. The worm farm was our most interesting ‘hub,’ providing some of our greatest learning opportunities. Initially the challenge was balancing the ‘quality’ and quantity of food waste we were receiving from the cafes via the bicycle collection system. Our compost windrow was large enough that we could throw mostly anything into it, including bread, cooked foods, citrus and coffee grounds without really throwing anything out of balance. Meat products were the only items strictly restricted from all compost systems. We had some difficulty, however, adapting the collection system specifically for worms. We couldn’t always pre-dict the quantity and types of food waste we would receive on any given day from the cafes. Some foods, such as coffee grounds and orange peels, we had par-ticular problems with. When other more palatable foods were available the worms would leave all citrus, cooked foods and grains, which would mold and rot, causing issues with odor and flies. We found it difficult to get participating businesses to give a variety of high quality ‘worm food’, ideally a mix of only fruit and vegetable scraps. Often we had bins completely full of stale bread, which was inappropriate as a feedstock for the worms and would have to be re-collected and sent to our composting site. In an attempt to rectify this I did extensive training with certain cafes designated as ‘worm cafes’. As the program grew, how-ever, it became apparent having too many ‘don’ts’ for the collection bucket became very confusing for the cafe staff and resulted in lower compliance and re-duced food waste collection rates. Eventually whole loaves of bread were the only item besides meat products banned from the collection, which was simple for the cafés to comply with and solved a large portion of our problems. As a solution for dealing with undesirable feed and overflow we used a combination of a commercial Bokashi composting bin and thermophilic composting on site with the worm farm. Bokashi is a method of breaking down food to prepare it for composting, or burying in the soil. It involves inoculating the bin with anaerobic bacteria in the form of a grain, which essentially ‘pickles’ the food. Liquid is released through the bottom of the bin (which could be diluted and used as a fertilizer) and the food material stays in a stable condition until composted, buried or fed to the worms. We found worms would even eat some undesirable foods once they had been through the Bokashi process. These alternate systems were generally used for items such as excessive coffee grounds (which upset the pH of the worm farms when added in large quantities), grains, citrus and onions which the worms tended to leave behind. The compost on site also acted as an essential overflow. One of the key problems was balancing the flow of food to the worms, giving them enough to eat but not so much that the food would spoil before they reached it, making it unappetizing to the worms and also causing issues with odor and flies. Before the op-tion of compost overflow was available the worm hub volunteers had to either overfeed the worms or leave the collected food waste sitting for days in the bin, neither a good option (or one appreciated by our neighbors!). We found in-vessel composting units such as the 400 liter Aerobin were best to prevent pests such as rats and birds getting in the compost, which was a big concern of the council and surrounding neighbors. Of all our compost hubs the worms produced the highest quality product, but also required the most effort and care. To keep the worms in good health volun-teers would feed, water and aerate each bin by turning lightly with a corkscrew compost turner. Food waste was shoveled into the bins four times per week, and covered with bedding and a hessian bag to prevent vinegar flies and encourage feeding. The opening of the bins being 3-4 feet above ground caused problems here as the food waste was often heavy and difficult to maneuver on a shovel, this turned out to be a major design flaw of the system. Volunteers also added carbon, kept moisture content between 70 and 90%, pH between 6.5 and 7.5 and checked for pests, flies, smells and excess food. We had a lot of interest from volunteers to work with the worms and learn the art of worm farming for their own household gardens or perhaps to take it on a larger scale for a community garden or school garden. We relied heavily on this volunteer interest, especially during the summer months when the bins would have to be misted with cool water on a regular basis. We also provided worms to local school gardens and gave tours of the site to groups that were interested in starting worm operations. Given the chance to run the program again I would have designed a tandem system using both worms and a composting windrow. Given the space, I would advise an operation with a compost windrow that handled all the ‘in-take’ for all the food waste. The worm farm would then be a ground level protected wind-row with drainage and cover that was fed the partially composted materials. Alternately I would recommend the use of the Hungry bin worm farm, a continu-ous bin system we had success with at other locations. A tandem system allowing for pre-composting would address several of our major problems, including food flow to the worms, homogeneity of the feed and reduction of food rotting or being rejected by the worms while providing a consistent high quality output of castings. The Food Know How program was a great success, and an excellent learning opportunity. We engaged over 30 businesses in the cafes program and reduced their overall food waste sent to landfill by about 60%. Our waste audits over time showed the cafes increased recovery rates with ongoing engagement and edu-cation and eventually changed their behaviors around food waste. Although funding for the program ended in 2014 the goal is to turn the food waste collection into a social enterprise that would charge the cafes a fee for collection and eventually compensate the volunteer cyclers for their time with wages. After two years I decided to return to my home state and am now a founding member of the newly established Rhody Worms Cooperative, working towards making small and medium scale worm farming a viable business opportunity in Rhode Island.